Tournament, book this experienced function band for your next event. Guaranteed to get everyone dancing with a vast repertoire of songs from 50s to present day. Tournament is the grown up version of Dual Control and most frequently go out as a five-piece for larger functions. 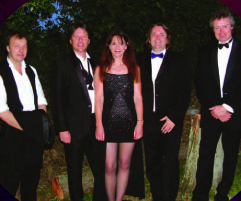 This group of professional musicians have an extensive repertoire and are very popular at weddings and corporate events. Tournament have been playing for many years and are led by their founder, singer/guitarist Keith Ryder. The personnel changes to suit requirements, although the basic line-up remains two guitars, keyboards, bass, and drums. The band is flexible and has often expanded to accommodate larger events, while occasionally cutting back to a four-piece if space or budget demand. Tournament have and continue to provide music for every type of event, from large corporate functions to annual dinner/dances, from weddings to small private parties. Catering for a wide range of ages is never a problem, as the band’s extensive set-list draws on material from the fifties through to the current charts. Clients have included …British Gas, Mercedes Benz, Baltimore Securities, BP, The Association of Master Plumbers, The British Academy of Composers and Songwriters, Reuters, and Penguin Books, as well as many private individuals. Tournament have played at venues including…The Natural History Museum, The Dorchester, The Science Museum, The Commonwealth Institute, London Zoo, The Victoria and Albert Museum, Clearwell Castle, The Saloman Centre, Villa Park, and The London Aquarium. This comprehensive set-list means the band is never short of material and between sets a CD disco is available, allowing the dancing to continue and specific requests to be catered for. The band also brings a self-contained PA system and basic stage lighting.